Black cat brings good Luck? 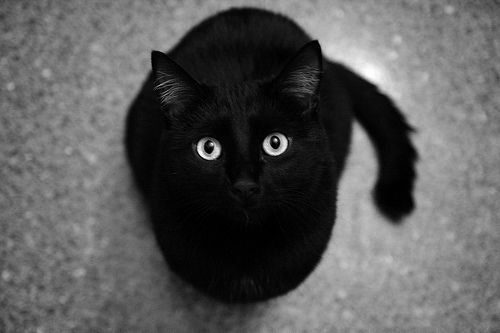 Black cats have been perceived in many different ways in different countries and customs. Most of them might be tied to ominous omen. Not a few black cats have been treated unreasonable ways. On the contrary, they are taken as a fortunate omen in Japan. It’s interesting to note black cats are recognized like a good luck charm, it’s quite the opposite from other perspectives of black cats. Servant H is reading a book in the living room. Johnny comes in. Servant H took her eyes off from the book and looked Johnny. Good afternoon, Your Majesty. I am reading a book about “Black Cats”. Yeah. Black cats not just look special, but their being inspires humans in many ways, positive and negative. Some people who perceive their black color as something negative. And treated them as such. I see. How have they been treated in Japan? It’s quite the opposite. They are considered to be good luck omen in Japan. Back in the Edo era, there was a superstition that black cats can cure tuberculosis. Speaking of superstition, people believed only single women and men become tuberculosis, therefore having a black cat can bring a good match as well. Also, they are considered as a beckoning cat who brings good luck, making money, and believed to expel evil spirits. It’s truly interesting with a different perspective, they can be devils or angels. Yeah. The contrast between their black color and their eyes are so vivid, that sparks humans imaginative mind and produce a lot of superstitions . I also heard myself when people come across a black cat, it’s a good sign, some says exactly the opposite. There’s no solid value, the value can vary. A long long time ago… There is a boy who is working at a large scale goods store. He had to work since nine because his family is very poor. His mother told him she feels really sorry, but he can come back home anytime he really can’t take anymore. At the time he was fourteen, totally fed up with getting pushed around. He takes days off only three-days for a year. He lived for that. But what made him sad is there seems no more space for him in the family. He just doesn’t understand why he had to leave home and why he can’t come back. And that home doesn’t feel home to him anymore. He was told to bring some goods to the important client on the way, he was killing a time on the river bank. Sudden heavy rain poured. He protects its goods putting inside his clothes, imagining both client and boss will scold him badly for wetting its goods. He gets sick with everything and wanted to escape from all of this. The moment he was about to take goods out and throw it away to the river, small crying hit his ears. Crying comes from the tree. He walked up to the tree and found a small black something. She was so small and dirty, but her eyes were so beautiful. Something clicked in his mind and he took her back to the store. He hid this small cat at the storage, give her food day and night secretly. That was good, H! That cute black cat brought him the fortune and made the store even more popular. Why don’t we have a black cat in our kingdom, too? That’s an excellent idea, Your Majesty! But we already have a good luck charm. Exactly! You are a red good luck charm yourself! Without you, there is no kingdom, nor this prosperity. Mmm, you have a good way of telling myself… You inspire me to come up with even a better idea! Black Cat Jiji in “Kiki’s Delivery Service”: Why He Lost his Voice?